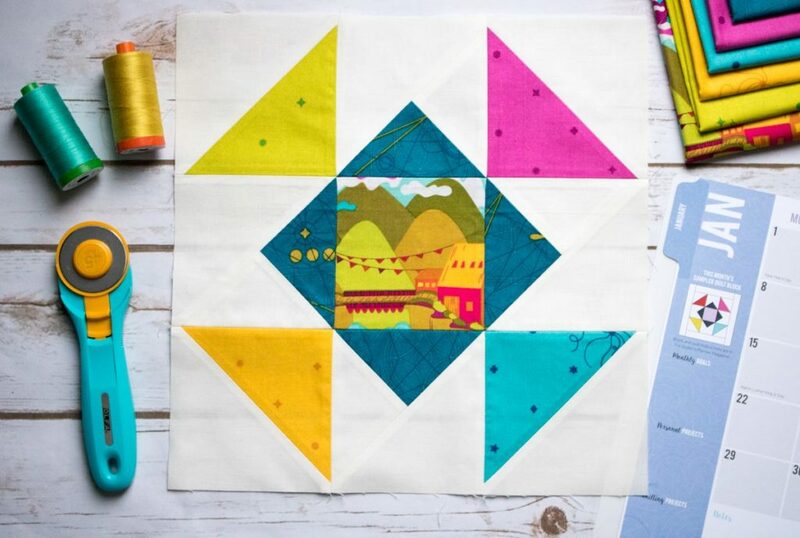 We hope you’re enjoying participating in our Quilter’s Planner Block of the Month Sew Along. For a reminder about how the BOM program works, and how you can enter to win great prizes each month, check out this post. You can join in at any point in the year! (Modern Bliss or Classic Beauty – see photos in the QP magazine for each). For those of you that are doing the Modern Bliss layout, remember that part of setting a block on point involves rotating it by 45 degrees. Some fabrics and even entire blocks may look completely different when rotated. 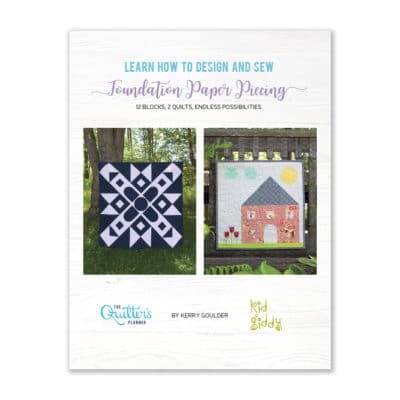 There are many ways to make some of the components that you will use to construct your blocks throughout this quilt. If you prefer to use a different method, you may do so, but be advised that it may require additional fabric/revised cutting instructions. The main components of this block are half-square triangles (HSTs) and split quarter square triangles (SQSTs). Many of us are concerned with our ability to achieve perfect points in our piecing. It can be a great joy, and sometimes it can feel like an enormous challenge. Many ask us, what can I do to achieve the best results with my triangles? Tip 2: What is a Scant 1/4″ Seam Allowance? A scant quarter inch seam allowance is a seam that is just shy of a 1/4 inch. 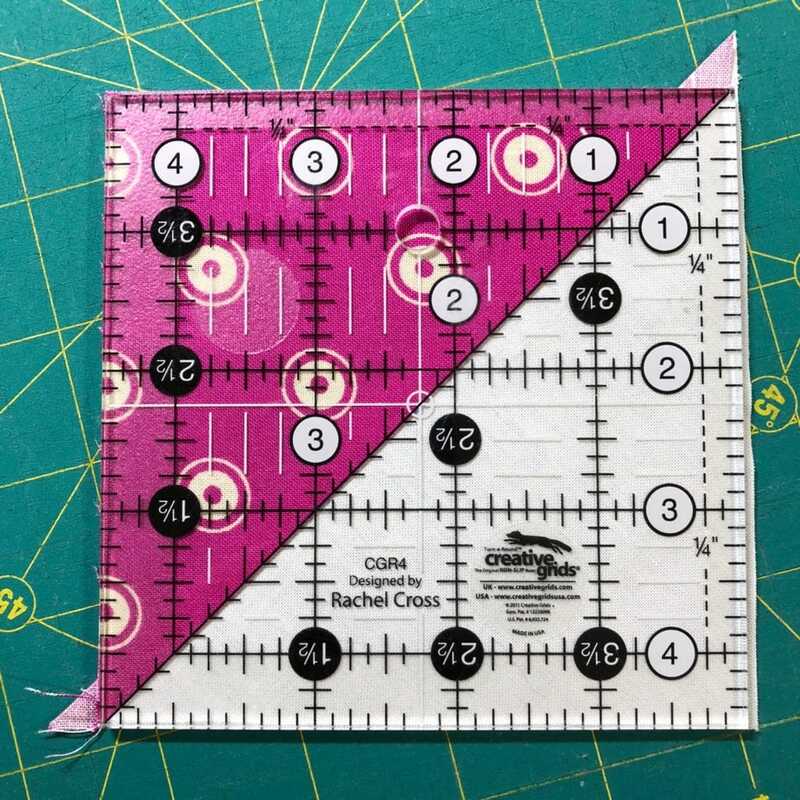 If you need help obtaining a scant quarter inch seam, consider adding the Perkins Seam Guide and Vinyl Seam Edge Strips to your sewing toolbox. They are affordable, and can really make sure your scant quarter inch is consistent forever more. The Perkins guide is placed under the presser foot and the needle is lowered through the hole in the guide to allow you to stick the vinyl seam stopper accurately next to the ruler, with confidence that you are marking a true scant 1/4″ seam allowance. Then you remove the ruler, and the thickness of the vinyl strip creates an edge that guides the fabric in front of the foot. To illustrate the difference between scant ¼” and regular ¼” seam allowance, look at the picture below. First I marked a line diagonally on the 5” square, as instructed in the pattern. To make it easier to see what a scant seam allowance looks like, I then marked a line exactly ¼” away from that first line. When sewing a scant 1/4″ seam allowance, you will be sewing a seam that’s about thread’s width more narrow than a typical 1/4″ seam. In the picture below, you can see that I’m sewing on on the inside edge of the line. It might not seem like a lot, but it really can add up. To ensure that your seam allowance is accurate, take a scrap of fabric and sew a line ¼” from the edge of your fabric (use the perkins guide first and the vinyl sticky tape if you have it) then measure it with a ruler. If it’s just shy of ¼”, great. If it’s not, make adjustments to your machine’s settings and keep rechecking until it is. The nice thing about using a square ruler is that they have a 45 degree line that runs from corner to corner. 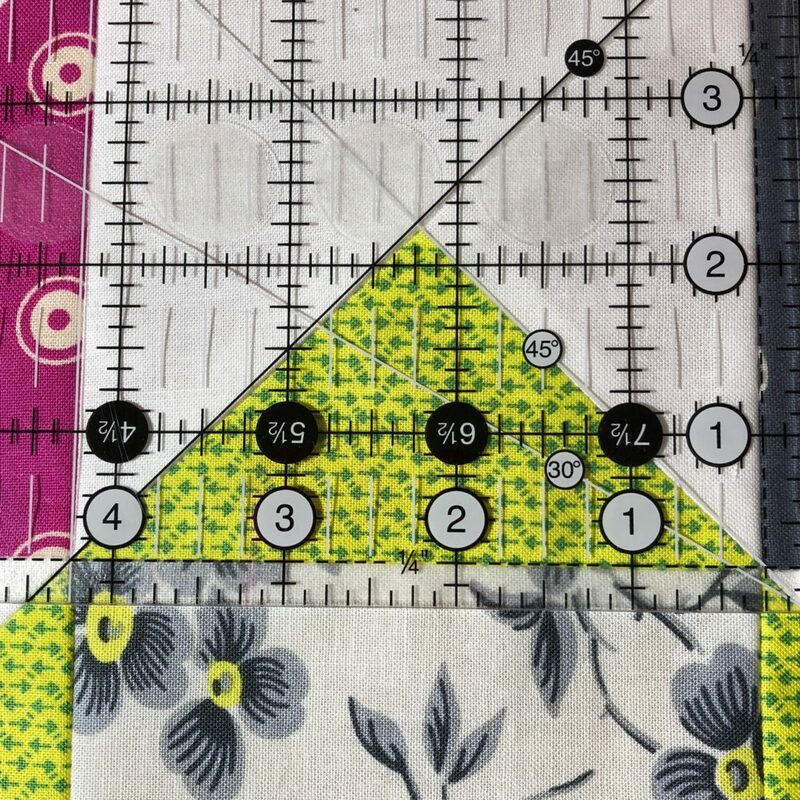 (We like to keep square rulers of various sizes in our quilting toolboxes.) Line up your seam with this 45 degree line. Then confirm that the edges of your block extend beyond the 4½” markings on the ruler on all 4 sides. Trim any fabric that hangs over the edge on the right. Carefully rotate the block and ruler to cut each of the 4 edges, making sure that the 45 degree line on the ruler stays lined up. 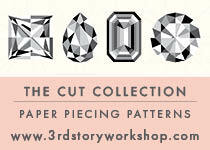 This can be done very fast if you have a rotating cutting mat (one of my favorite tools in my sewing arsenal! ), but you can also carefully pick up the block and turn it to the next side as needed. If you’re using a 6″ x 24″ ruler as shown below with the yellow markings, you may notice that the 45 degree line does not go all of the way down to the corner. That’s ok because you can still see the line at 4½”. Just carefully rotate the block and ruler to cut each of the 4 edges, keeping that seam lined up with the 45 degree angle. 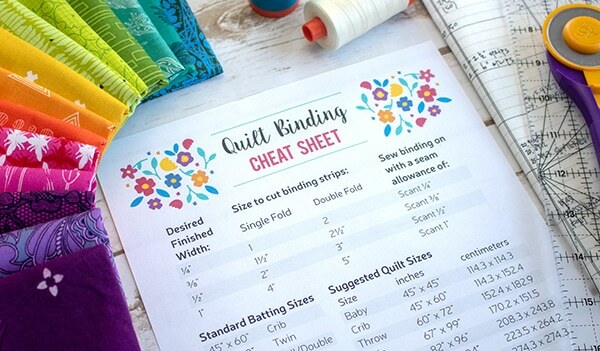 As a side note, there’s an ongoing debate in the quilting world about whether it’s best to press seams to one side (the dark side) or to press them open. My general suggestion is to follow the recommendations of the pattern designer. Some provide instructions for the best direction to press seams in order to help you reduce bulk and nest seams. Pressing seams open generally allows for a quilt top to lay more flat, but has drawbacks (weaker seams, less of a clear ditch for stitching in the ditch during the quilting phase). With that said, in the interest of transparency, I personally prefer to press my seams open. There is no right or wrong answer here though. I recommend squaring up the HST unit before you make the SQST in block assembly step 2 (see the previous part of this post about squaring up an HST, BUT don’t forget that you will be squaring to 5” this time). While it’s not necessary to do, by taking the extra time to trim your HST unit, you can match up all edges of the square and have the greatest likelihood of success when you go to square up the finished block. Once you have your HST squared, you are going to layer your freshly squared 5” HST block and a 5” square of background fabric, right sides together. You will now mark a line like you did for creating HSTs. When you’re marking your line, it needs to be perpendicular to the seam on the HST. This is absolutely essential. (See the illustration in the pattern itself). Before you assemble the components of block 1, you need to square your SQST. This can feel tricky at first, until I tell you about your key landmark in lining the block up under your ruler. 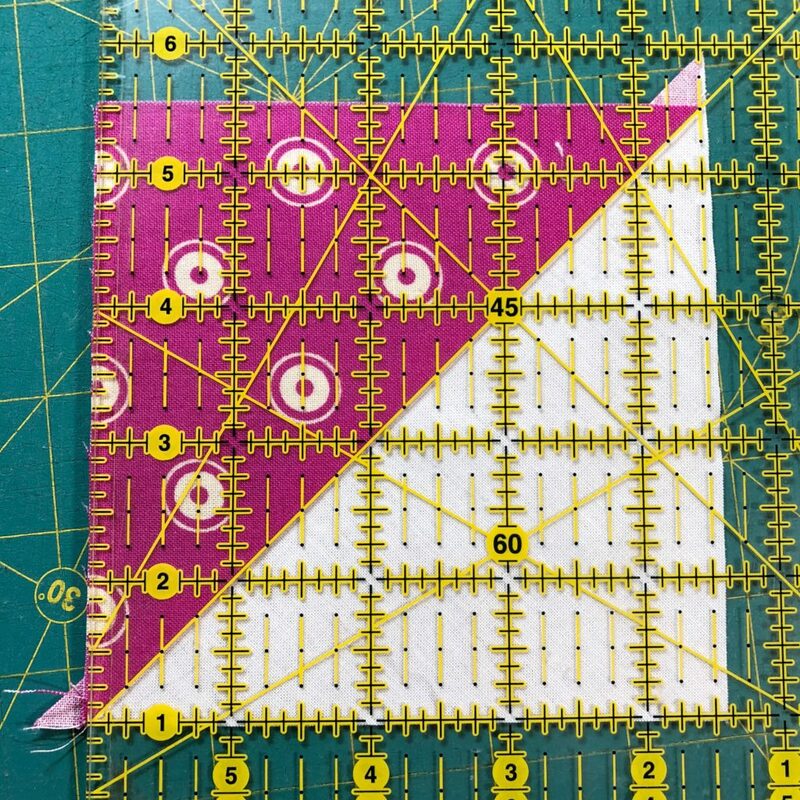 Your key landmarks to align are going to be the top point of the triangle (where Fabric F meets the background), and the seam on the bottom corners of the geese. The top point of the triangle should be 2¼” up from the bottom and 2¼” in from the sides (It doesn’t matter if you measure from the right side or the left side. I’m left handed, so I usually measure from the left.) The other key alignment points are ¼” inch away from the edge at the bottom (so the corners will stay nice and pointy). If you have a square ruler, take advantage of the 45 degree line that crosses the ruler. You can line it up with the seam on the block. I’ve also seen a few questions in our Facebook group about how to get from the diagram in step 2c (at the top of page 28) to the Row X assembly picture in step 3. The simple answer is that it’s just a matter of turning the block. You need to have the dark blue triangle oriented so that it will be touching the center square. As noted in step 3, the direction of your seams (from sewing the HST to the background square to create the SQST in step 2) does not matter. You just need to have the dark blue side against the 4½” center square. Now that your pieces have been properly squared, it’s time to lay out your pieces and join them into rows. I can’t overstate the importance of sewing with the correct seam allowance. As a reminder, this pattern specifies using a scant ¼” seam allowance. I find that using pins makes a big difference in having points lined up. I will use a pin at any intersection where 2 seams match. I will sew slowly until I’m just a few stitches away from the pin, stop, remove the pin, and continue until I have to repeat the process. 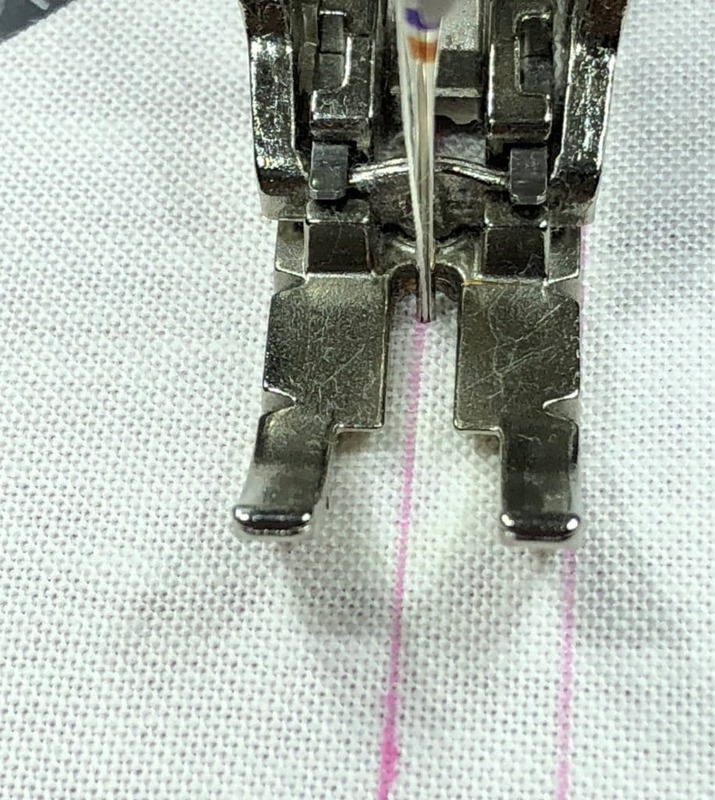 Yes, it may be more time consuming but sewing over pins can be dangerous (broken needles, broken pins, hitting something in just the “right” way so that you knock your machine out of time). If pins don’t work well for you, you may want to try glue basting (Stephanie loves this method). You need a 4 oz. bottle of washable Elmer’s School Glue and a plastic glue tip (metal tips can rust and ruin your glue!). 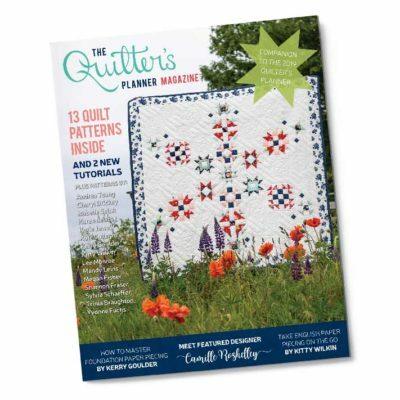 Check out this article at Diary of a Quilter by Christy Fincher for more information about this technique. Even when you’ve cut and sewn everything accurately, sometimes it just doesn’t work out quite as well as we had hoped or planned. I’ve seen quilts at designer trunk shows, trade shows, and consumer shows that don’t all have perfect points. It happens to all of us. So, fix it or don’t. It’s totally up to you. If it’s going to bother you every time you look at it, my suggestion would probably be to rip and redo, but that’s just me. Stephanie says she leaves most of her imperfections because she likes to embrace her flaws, and she’s always amazed about how those imperfections disappear after quilting. There’s no wrong answer. You do you! So, that’s all I have for you now. 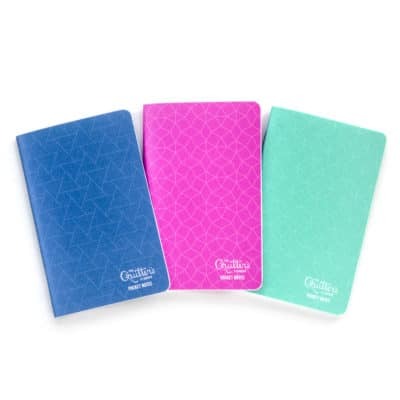 If you have any questions, please tag @quiltersplanner on Facebook. Our team is here to help!